The photo shows the homeplace of the Sextons (of Lot 5, near the school), Scobaun. The 6 inch OS map from the early 1840s and the Griffith’s Valuation record appear to indicate that an ‘office’ or outhouse, though not a dwelling house, was situated at the eastern end of the property but there is no trace of this building now. There are currently two houses on the property. The older house of the two probably dates from around 1900 and is a two storey house, currently unoccupied. It is clearly visible on the right hand side of the picture. The family moved into the new bungalow (visible on the left) in the 1970s. The current owner is Mrs Bernadette Hayes, a grand-daughter of Tim Sexton (1922-1997), the last Sexton to live in Scobaun. But let us go back a couple of centuries to trace the history of this branch of the Sextons. Cornelius (c.1765-1835) married Helena (original surname unknown) (1772-1866) and they had at least three children: John (1797-1873) who farmed Lot 7 alongside the road, immediately east of Doonen National School, Mary (c.1800-18??) who married James Leary in 1823 and farmed land at Glasheenaulin, and Hanora (c.1805-18??) who married twice – first to a Brien man and, following his death, to a widower, Timothy Hegarty of Fahouragh, in 1864. John (1797-1873), was the Cornelius’s oldest and, perhaps, only son. 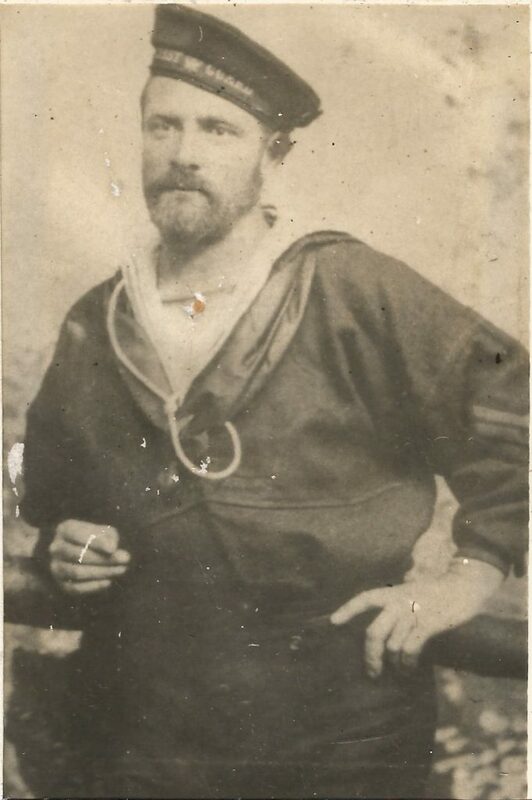 He is referred to in some records as John Sexton Senior (to distinguish him from another John Sexton, his cousin, who lived on Lot 4) and he had three and possibly four sons. John’s oldest son, Cornelius ‘Curly’ (1819-1900), leased land for a time at Glasheenaulin but appears to have got into difficulties at the time of the famine. He and John Hourihane had stood as sureties on a £2 loan taken with the Castletownsend Loan Society in October 1846 by Patrick Keane of Glasheenaulin. These short-term loan funds (usually 20 weeks duration) were common at the time provided the poor sector of society with access to credit at relatively low rates of interest. They had been highly successful in the 1820s, 1830s and early 1840s with very low rates of defaulting. There were around 13 such loan societies operating in Skibbereen area alone. Two guarantors were required to secure the loan if the borrower defaulted. These loan schemes worked remarkably successfully until the calamity of the Famine resulted in widespread defaulting. While a subsequent report to the Clerk of the Peace appears to indicate that John Hourihane and Patrick Keane had become paupers, Cornelius Sexton was reported as holding a small farm in good circumstances. So why was he reported as having gone to England by 1849? The explanation seems to be that the townland of Glasheenaulin was now held ‘in Chancery’ – effectively held in trust by the Courts. This seems to have resulted in the immediate lessor, Thomas Hill, taking possession of 131 of the 133 acres that made up the townland. Cornelius was effectively evicted and either chose or had no option other than to emigrate. While the report reports that he had gone ‘to England’, it would appear, in fact, that he had gone as far as Wales and no further. We will take up the story of the Cardiff Sextons a little further on. John’s second son, Patrick, leased land (at Lot 5) along side his father (Lot 7). Griffith’s Valuation, however, makes clear that while Patrick leased land at Lot 5, he did not have a dwelling house there. He lived further up the hill on Lot 4 alongside the other Sextons (the family of Cornelius’s brother, Tim). It might seem a little unusual that his house did not stand on the land the family farmed but this is perhaps explained by the fact that Lot 5 and Lot 7 were originally owned (or, more accurately leased) by his father who had, in the 1830s or early 1840s, secured the lease previously held by Pat and Michael Henry. The homeplace on Lot 7 was occupied by his father, John Senior. It is likely that when Patrick got married (to Mary Hourihan), he was the beneficiary of his father’s decision to subdivide his new larger lot. Subdivision of this sort was very common in the decades before the famine. It is not clear why he didn’t build his own house or occupy the ‘office’ or farm building on Lot 5 indicated on the OS map and in Griffith’s Valuation. It is likely that there was, in fact, no dwelling house on Lot 5 as the Henry brothers may have lived on one of the other Henry properties in Scobaun indicated in the Tithe Allotment books of 1825. Perhaps it was simply more expedient for Patrick to move into an existing building on his cousin’s land (on Lot 4) further up the hill. Interestingly, Patrick’s house on Lot 4 was labelled as 4a which opens up a whole new mystery which we will return to in another section. At first sight, it may appear odd that Patrick or one of his brothers did not inherit their father’s holding (Lot 7) upon John’s death in 1873. Instead, the homeplace passed to Timothy Horan and subsequently to Owen Sweeney of Farranconnor sometime in the 1878-1880 period. The explanation is, however, clear enough. As we have already seen, John’s oldest son, Cornelius, had left Ireland, never to return, during the years of the Famine. Another son, James, was also dead by 1844 and it is possible that another (possibly called Denis) had followed Cornelius to Cardiff. Timothy Horan, who was quite possibly a first cousin of Cornelius, Patrick and Denis, had probably come to live with John as a farm labourer (indeed he is recorded in the 1901 and 1911 censuses respectively as a labourer and retired labourer). It might have been presumed that John would have passed on his holding to his eldest son, Cornelius, but Cornelius was long since gone. For some reason, John chose not to pass the Lot 7 holding on to Patrick who farmed Lot 5 alongside but instead chose to give it to Timothy Horan. Timothy had two sons of his own, William and David, but, for whatever reason, either Timothy chose not to stay farming or his lease was not renewed by his landlord. If the former was the case, one can only imagine what Patrick would have made of Timothy’s decision. It is likely that a third son was James Sexton, born in the early 1820s. James, like his older brother, Cornelius, leased land (or shared the lease of land) in the neighbouring townland of Glasheenaulin. In the years before the Famine, the Sexton holdings in Glasheenaulin may have acted as a type of out-lying farm to the main holdings in Scobaun. The land in Glasheenaulin was rougher land, perhaps more suited to summer grazing than to tillage while the land at Scobaun was of good quality as indicated by the townland name: an Scoth Bán meaning, quite literally, excellent in-field. James was married to Kate (Catherine) and it would appear that James died in late 1843 or early 1844 as loans issued by the Castlehaven Loan Society to Catherine and James Sexton in November 1843 were being taken out solely in the name of Kate Sexton by March 1844. Denis Sexton is something of an enigma as there appears to be no record of his existence in Ireland but we can trace his appearance in Cardiff through the census returns for England and Wales in the late 18th century. Denis was born in 1828 and went with his brother, Cornelius to Cardiff (or followed after him) around 1848. He appears to have been married to Catherine (original surname unknown) who was born in 1831. Denis is important to our story not least because he had a son, James born in 1862, who in turn had twelve children many of whose descendants are presumably still living in the Cardiff area today. Before we move on to the next generation of Sextons descended from Cornelius of Lot 7, let us take a look at what became of Cornelius Sexton (1819-1900) after his departure for ‘England’ at the height of the Famine in around 1846. The 1871 Census of England and Wales records one Cornelius Sexton, aged 50, living at Landore Court, Cardiff, with his wife, Ellen, and children: Ellen (16), Arthur (15, most likely named after his maternal grandfather), Bridget (13), Catherine (11), Margaret (9) and Cornelius (7, named after his father). Ellen, Cornelius’s wife, is, it would seem, Ellen Burns – quite probably from Dooneen or Lickowen or (less likely) from Union Hall. It seems very likely that this Cornelius Sexton is the same man who fled Glasheenaulin around 1846. We might have expected to find a first-born child by the name of John – named after his grand-father – to have been on the census record. The fact that there is no such John is easily explained however. As John would have been at least 17 years of age, he could quite possibly have moved out of the very crowded family home. Alternatively, he could also, of course, have died as a child. Landore Court was a notorious slum area in Cardiff and child mortality rates would have been high. Later censuses indicate that there was also an older sister, Mary A., who has also moved out of the family home. By 1881, the family was still living at Landore Court (at no 23). Mary is now 28. Arthur was now working as a labourer, Ellen and Catherine as general servants, Cornelius as a labourer. Bridget and Margaret may have been living elsewhere or were dead. Ten years later, the 1991 census finds the family living at 22 (Canal Street) Frederick Street (St John), Cardiff. Incorrectly recorded as Seaxton on the census, Cornelius now aged 72 is recorded as a haulier and there is a record of a grandson, Cornelius, born 1883, a scholar. The first census of the 19th century finds Cornelius, incorrectly recorded as 74 years of age and now a widower, still living at 22 Canal Street. He is listed as a retired haulier and living with his daughter, Mary A. Sexton (48), unmarried, and a grandson, Cornelius Sexton,aged 18, who works as a publisher’s assistant. It is unclear whether young Cornelius is Mary’s illegitimate son or whether he is the son of one of Mary’s brothers. A second family of Sextons is also recorded as living at Landore Court in 1871. While it is possible that this is mere coincidence, a much more plausible explanation is that the Denis Sexton recorded is a younger brother of Cornelius, Patrick and James. Born in 1828, he followed his brother to Cardiff and worked as a brewer’s labourer. His wife was Catherine, born 1831, and he had children, John (12), James (9), Catherine (8), Ellen (5 and who died shortly afterwards), Denis (4), Margaret (2) and Patrick (1). Given that the boys’ names are John (named after his grand-father), James (named after his dead uncle or possibly his mother’s father), Denis (named after his father) and Patrick, named after his uncle at home in Ireland, it seems impossible not to conclude that Denis is a grandson of Cornelius. By 1881, the family (incorrectly recorded as Saxton) is living at 1 Ely Common, Llanduf, Glamorgan where Dennis (sic) is recorded as working as an agricultural labourer – though it is possible that this entry refers to a different person entirely. By 1891, Denis a widower and living at 38 Wellington Street, Canton, Cardiff and employed as a brewer’s labourer. Of the children, Ellen is dead and James has left the family home. The others are all unmarried with Catherine taking on her dead mother’s role as housekeeper, Margaret a dressmaker, Denis a labourer, Patrick a haulier. Twenty years later, James now 48 years old, is an ale and porter merchant living at 65 Dorset Street and has twelve children (see next paragraph below). His father, Denis, is presumably dead. There is no record of his brother, John. His brothers, Denis, now 44, and Patrick, now 42, are both still single and living at 45 Dorset Street with their sister Margaret Mullins (nee Sexton). Interesting, Charles Sexton, aged 22, a librarian, and a nephew of Margaret, lives with her and her brothers at 45 Dorset Street. It can probably be assumed that Charles is the son of James (the ale and porter merchant) or, less likely, of her older brother, John. Charles later served as a 2nd Lieutenant in the Army in the Great War and died as recently as 1961. His last known address was at 32 Heol Gabriel, Cardiff CF141JU. He appears to have had a daughter, Cecilia, who might still live at this address or tel 01 222 628115 (old) 00 44 29 20 628115 (new). James, second son of Denis and nephew of Cornelius (both of whom, as we have seen, fled during the Famine) was born in Cardiff in 1862, and married Harriett (born Macclesfield, Cheshire supposedly in 1876 – which appears to be an error). His children were Kathleen (born 1888), James (1889), Dennis J. (1892), Eileen (1894), Bernard (1899), Gertrude 1902, Edward (1904), Margaret (1905), Winifrid (1906), John (1907), Sheila (1911) and Patrick (1910). It is interesting that while James’s first born son, James,was named after himself, his second born (Dennis) is named after his own father and his last two (John and Patrick) are named after his two brothers. His third and fourth are presumably named after their maternal grandfather and uncle respectively. It is also interesting that the names are a mixture of Irish and English Christian names reflecting his marriage to an English woman. We don’t as yet know a lot about John Sexton but he is important as, being the eldest son, he inherited the family holding and carried on the line that continued to live on Lot 5. He was one of at least seven siblings and was married to Mary Collins on 25th February 1873. Mary died at the age of 55 on the 11th June 1913 and was survived by her husband. The other children of Patrick and Mary Sexton (nee Hourihane) were Ellen (b. 1846), Timothy (1852-1873), Ellen (b.1855), Patrick (b.1858 or possibly 1865) and Susan (b.1865). It might seem unusual that two children had the same name but the likely explanation is that the older Ellen died at a very young age and the name was chosen again for the next daughter. An interesting sidenote here is that Patrick Sexton (G5 b.1858 or possibly 1865) may well be the direct ancestor of Joseph Sexton III of Lowell, Mass who visited Scobaun in 2018. More research is required to trace this line fully. Timothy Sexton (1885-1964) continues the line of occupiers of of Lot 5 and was married to Jane Sullivan (b.1883) of Derrygool, Skibbereen. They were married on the 23rd November 1915. One might suppose that Timothy, as the fourth son, might not expected to have inherited the family holding but he did so as his older brothers, Patrick and John, emigrated to the US while the remaining older brother, Cornelius, joined the Irish Guards and was to become one of the estimated 35,000 Irishman who died in the Great War. Other than Timothy, the remainder of the large family was made up of Mary (b.1874) who emigrated to the US, Patrick (b.1875) who emigrated to the US, John (b.1977) who emigrated to the US, Cornelius (b.1879 who died on the battlefields of Flanders (see below), Ellen (b.1881) who died young of tuberculosis, Michael (b.1891) who also died young of tuberculosis, and James (date of birth and death unknown). The fact that just one of the eight children lived his adult life in Ireland bears testament to the harsh conditions of life throughout much of Ireland during the late 19th and early 20th century and was, in truth, not an unusual occurrence. Emigration and early death were all too common – particularly in marginal areas like west Cork. At this point, it is not known if Patrick (b. 1875) and John (b.1877), both of whom went to the US, had families and continued on the Sexton name there. Cornelius Sexton, as we have seen, was the sixth child of John and Mary Sexton and joined the 1st Battalion of the Irish Guards in Cork a shortly before the outbreak of the Great War. His service number was 8512 and he served as a private on the western front. His great grand niece, Bernadette Hayes, reports that he was an accomplished fiddle player and that prior to the outbreak of the war, he was engaged to an Australian girl whose name, unfortunately, is not known. He was posted to the front and died of wounds to the spine on 23rd July 1916. He is buried in Lijssenhoek Military Cemetery in West-Vlaanderen (Flanders), Belgium not far from Ypres (Grave no 7 D 3A). His medical card reference is no WO 372/17/229754 and is held at the National Archives – War Office in Kew, London and there may be a reference to him on the Casualty Clearing Station Records also at Kew (Ref. MH106/419). Following his death, Cornelius’s uniform and fiddle were returned to his brother, Tim, in Scobaun (both his parents being now dead). After the war Tim was also sent his war medals which were kept in a drawer in the house. In the newly independent Free State that emerged from the War of Independence, veterans of the Great War were largely forgotten about and this certainly seems to have been the case for Cornelius. Other than within his immediate family, few people in Castlehaven (including his neighbours and relatives) appear to have kept any memory of Cornelius and his sacrifice. A happier postscript to this story, however, is that on the 23rd July 2016, the centenary of his death, flowers were planted in Cornelius’s grave with soil brought from Scobaun by his namesake and cousin, Con (Neilie) Sexton. 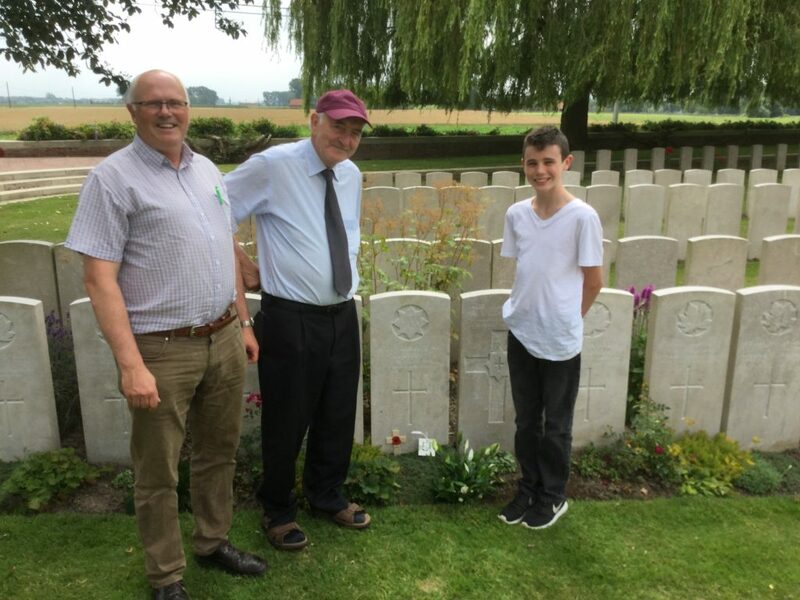 In visiting Lijssenhoek on the 100th anniversary of his death, Con and his son, Michael, and grandson, Colm, were almost certainly the first visitors from home to visit his grave. In accordance with tradition, John was named after his paternal grandfather, John Sexton (G5). Mary Kate was better known as Kathleen and ….